The walls in many homeowners’ basements tend to be troublesome, commonly cracking or letting in moisture. These can seem like small problems, and usually, they only require small solutions. However, when homeowners experience leaning walls, they should not wait until the problem worsens to contact a professional foundation repair contractor. Leaning walls or bowing walls are extremely unsafe, threatening the structural integrity of your home. The possibility of collapse means that these walls create an unsafe living environment for you and your family. The leaning walls in your home are not small problems and should not be treated as such. For these leaning wall repair problems, we have answers at Rapid Foundation Repair. Leaning walls are generally pretty hard to spot, as the lean typically begins near the top. As the wall leans in, your home becomes more and more unstable. Leaning walls may also cause other foundation and water problems to develop in your home. If the affected walls lean far enough, they may begin to crack. This allows water to enter the basement, potentially causing water stains, mold, or damage to the structural integrity of your home. Besides water, insects or small critters might also make their way through the cracks in your wall, creating even more of a hassle for you and your family. At Rapid Foundation Repair, we use only the highest quality Earth Contact Products (ECP) products to repair your leaning walls. The most common solution to leaning walls is reinforcement with our helical tiebacks and anchors. With the ability to be installed in any weather and very little cleanup necessary, helical tiebacks are the best option for too much pressure on your walls. First, a small hole is drilled into the ground in the yard adjacent to the leaning wall. 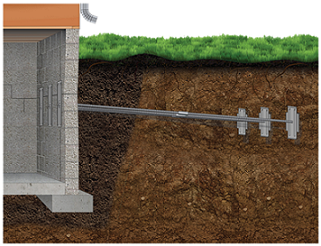 Next, an anchor is put against the wall of your home with a long rod protruding and connecting to a small, stable structure installed in the hole that was drilled in the ground outside. This relieves some of the pressure from your walls and keeps the soil around your home from expanding and making your walls lean. If you’ve got leaning walls in your home, do not let the problem continue to get worse. 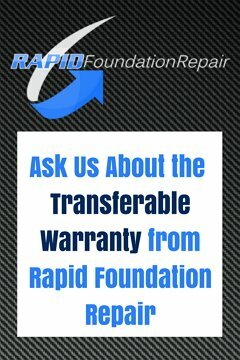 Call Rapid Foundation Repair for a free estimate. Our staff will survey your home and find the best solution for you and your family. For a fix for your leaning walls problems, contact the professional team at Rapid Foundation Repair today. We’re your number one leaning walls South Dakota and leaning walls Wyoming team!